When the Casio SK-5 is circuit bent it becomes somewhat unplayable from the keyboard when using the new modifications as you tend to find that each key will do something completely different to every other key, the effects don't actually play in tune up and down the keyboard in any kind of meaningful way, or using certain effects the keyboard is disabled and effects are only applied to looped samples, but as a bizarre FX and alien soundscape generating machine it is unsurpassed. 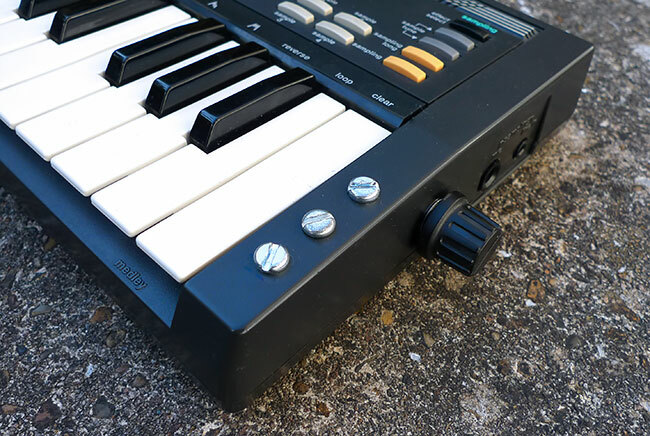 The SK-5 mods are much the same as the SK-1 version but with a couple of differences. Patchbay - Exactly the same as the main patchbay area on the SK1 version. 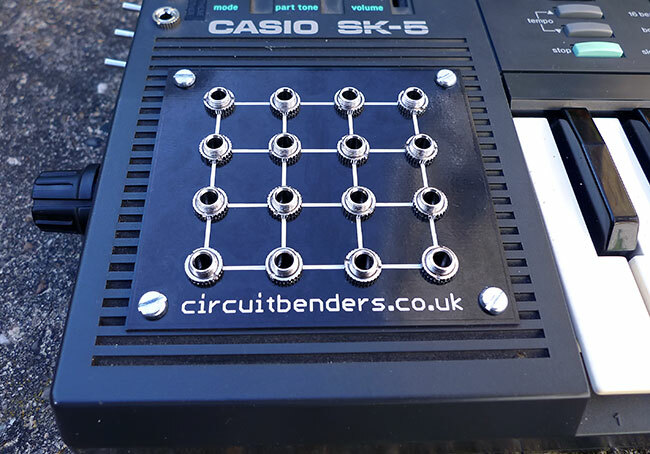 This consists of 16 x 3.5mm jack sockets that can be linked together using patch cables. Patching Sources and Switches - These are 3 sockets on the top left of the panel. 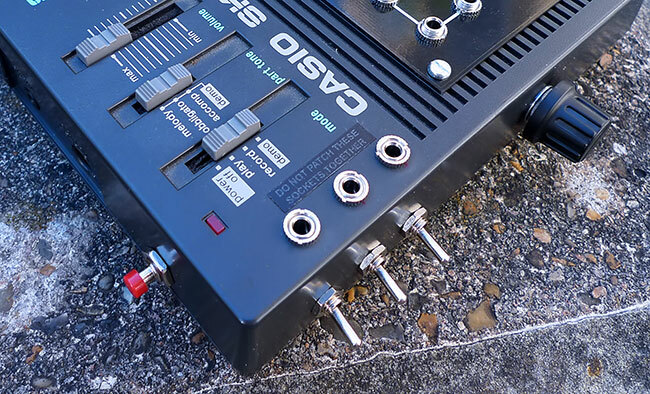 Each socket has its own associated switch which can turn on/off any effect made by patching between the patching sources and the main patchbay. Many of the most dramatic and useful effects available are sourced from these sockets and can be activated at the flick of a switch. These three sockets should never be directly patched together, so a label is added to warn against this. 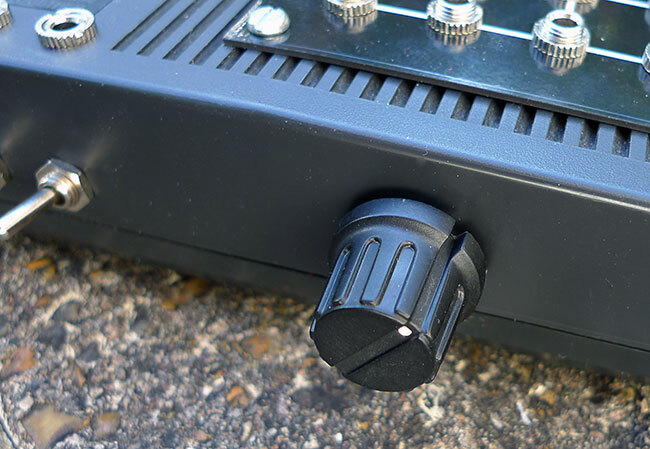 Drum Pitch Knob - This knob of the right hand side controls the pitch of the percussion, including the laser, lion and bongo pad sounds. This knob doesn't change the speed of the drum loops but takes the pitch from crunchy 8 bit grinding at the bottom to sharp blips at the top. The screaming aliasing of the percussion sounds at low pitch settings has to be heard to be believed. Drum Pitch Body Contacts - These consist of three bolts on the right of the keyboard. When you touch them individually or together they cause total chaos with the percussion pitch. Different effects are obtained depending on which contact or contacts that you touch i.e. touching contact 1 causes a slight pitch change but touching contact 1 and 3 causes the drums to drop to subsonic groaning, or 3 and 2 might take the drums up to chipmunk pitch levels. The effect varies in accordance to how much skin you have in contact with the bolt head. If you lick your finger tips beforehand, stronger effects are obtained. Soft Reset - If the machine appears to have locked up, the red button on the rear will usually reset it without having to turn it off and back on. This optional pitch knob and associated switch controls the clock speed, and therefore the pitch of the unit. The switch is to change between the standard pitch, so you can actually play in tune if you want, and the pitch as controlled by the knob. The reclocking knob is the knob you can see on the left hand side of the machine. 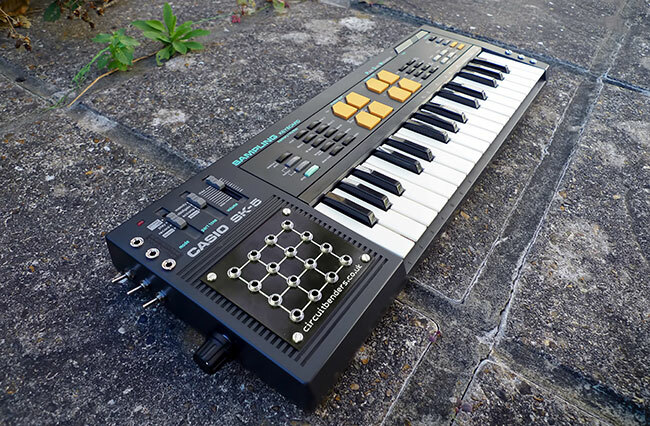 If you want your SK5 modded get in touch using the CONTACT form.